Coming up with recipes is truly something that feeds my creativity. I love when my manager asks me to “come up with a recipe”, because it sends me into my kitchen… one of my favorite rooms in our home. This recipe came from a desire to create something using leftover chicken, yet have a meal that could be popped in the oven by whomever got home first that night. As you can see, this looks like a “real” recipe, as opposed to most of my posts. The reason is that I plugged this recipe into “My Recipe Builder” app so I could figure out the calorie count. While I usually don’t do this when blogging, the written recipe will be included this weekend at James River Cellars’ Petit Verdot Vertical Weekend and I needed to have it look more official. Saute’ onion until softened, adding garlic if desired. Add salsa, undiluted soup, drained and rinsed black beans, and wine. Stir in chicken and mix until flavors combine nicely. Spray the bottom of a 9×13 baking dish with cooking spray. Cut the corn tortillas in half, then slice each half into 4 pie-shaped bites. Separate the tortilla pieces in half and spread half across the bottom of the baking pan. Layer salsa mixture on top of the tortilla layer, then top with half the cheese. Top cheese with the remaining tortilla pieces. Cover the tortilla pieces with the remaining salsa and top with cheese. I found this casserole to be really tasty. I cut the casserole into 8-square shaped pieces and it was a really filling dinner. As always, you’re welcome to swap out ingredients to suit the tastes of your family… that’s the best part of making your own dinners. You can even make this into a vegetarian dish by using shredded zucchini or diced eggplant or tofu in place of the chicken. Try this sometime and let me know how you, and your family, likes this dish. We loved it! 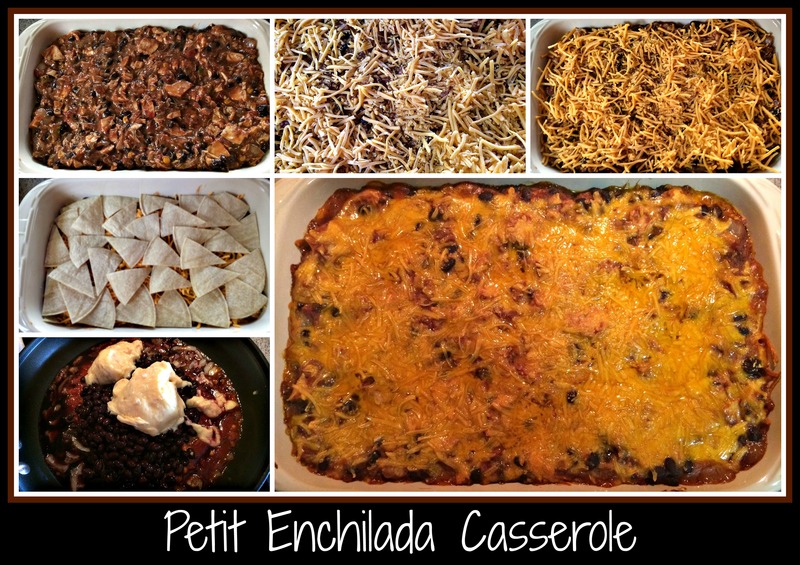 This entry was posted in Cooking, Recipe, Wine and tagged casserole, chicken, Gunther's Spicy Black Bean Dip, James River Cellars Petit Verdot, mexican, petit verdot, red wine, salsa, tortillas.